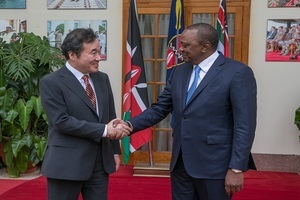 Kenya’s dream of fast forwarding it's affordable housing agenda alongside other initiatives which include energy, agriculture and healthcare has received an enormous push after Prime Minister Lee Nak-yeon who visited the country and extended support. Affordable housing is among the four development pillars that President Uhuru Kenyatta has identified for implementation in his term as president. The Big Four initiative will potentially see 500,000 homes developed over the coming five years. Towards this initiative, 300 acres of land was set aside by Tatu City for the construction of 10,000 affordable houses in Kenya and close to 40,000 people will be beneficiaries of the 10,000 houses that will have several amenities and good infrastructure. Companies around the world are eyeing a piece of the development package with many choosing to explore the East African opportunities through world class platforms like the premier Buildexpo Africa. The event provides a great opportunity for B2B interactions between developers, government agencies involved in construction and multinational companies looking to break into the market and secure contracts. Nairobi and Seoul already have cooperation agreements in agriculture, fisheries, energy and infrastructure, along with healthcare and is yet to add housing. The PM confirmed the reports during the Korea-Kenya Business Forum that seeks to spur more Korean startups to make entry into East Africa, also stating that South Korea is keen to provide affordable housing support, if the government of Kenya wants the assistance. To boost the idea, Kenya will also receive a whooping US $2bn grant from the United Nations between 2018 and 2022 for the ‘Big Four’ development agenda; this is after Treasury secretary, Mr. Henry Rotich signed the agreement for the UN’s Development Assistance Framework (UNDAF).